Charles Anthony Corbett (CAC) Wilson (1827-1923) was an English migrant and chartered engineer whose father was a London solicitor. He migrated from London to Australia in 1851 and joined the gold rush at Golden Point near Ballarat, but soon found that this was not a particularly productive pursuit and headed to Geelong where he found work surveying the Geelong-Melbourne railway line. Between 1854 and 1860 he worked as an assistant engineer with the Central Roads Board, surveying the Geelong-Ballarat Road and contributing to a number of bridge designs in the region, including the iron Barwon Bridge which opened in 1859. In 1857 he married Maria Connor Powell. The couple and their large family of 15 children lived in Teesdale. In 1863 CAC Wilson took up the positions of engineer and secretary for the Shelford District Road Board which the following year became the Leigh Shire. One of his early projects for the shire would have included a bridge over the Warrambine Creek (a tributary of the Barwon River) on the Lower Western Road (Hamilton Highway) at Laing's Hotel past Inverleigh. The bridge was to be 30ft in length and have three spans. It was to take the place of an earlier ford and perhaps was seen as an urgent improvement after an accident only a few months before in October, 1863 when a mail coach attempted to cross the flooded Warrambine Creek was washed away, losing the luggage and most of the mail it was carrying and presumably the horses which could not be cut from their traces in time. The driver and a passenger however, made it to safety. Another early design produced by Wilson was the plan for the construction of a new bridge over the Native Hut Creek at his home town of Teesdale. From the 1860s, Wilson had been making periodic reports requesting various repair measures for the bridge until in 1877 he finally indicated to the council that it was in need of replacement. Accordingly, he drew up the plans and in February 1879 the contract was put out to tender. The bridge was to include a single masonry pier with masonry abutments on each bank, supporting a timber deck topped by road metal. Little more than a month later, work was under way. By the turn of the century however, the decking timbers in the new bridge were deteriorating and in 1901 Wilson, as shire engineer, was calling for funds to have the timber supports replaced by steel girders. I suspect these measures were implemented as the bridge today fits this description. Wilson was not only an accomplished engineer, but also a revolutionary one. Many of his bridge designs were influenced by his relationship with the Department of Engineering at Melbourne University who at that time were conducting research into the construction and design of wrought-iron bridges. 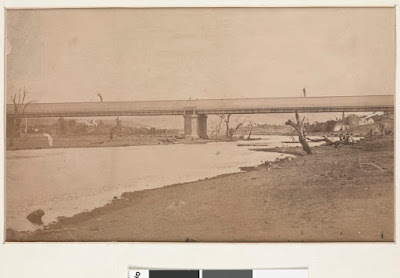 This relationship is reflected in bridges such as the Barwon Bridge mentioned earlier and the wrought-iron girder bridge over the Leigh River at Shelford, built between 1873 and 1874 which I showed in a previous post. Not surprisingly, another of Wilson's projects was to design the new shire hall which was opened in 1872 on the Rokewook-Shelford Road - a relatively isolated location, yet one which was central to the major towns of the shire. Closer to home again, Wilson was also the engineer responsible for the construction of the Black Gully dam, built between the towns of Inverleigh and Teesdale in 1874 as a potential water supply for both towns. Today, this site can be found near the north east boundary of the Inverleigh Flora and Fauna Reserve where the remains of the dam can still be seen. Plans to use this water supply however were short-lived. In 1880 when severe flooding damaged the dam wall, the cost of repair was deemed prohibitive and it was decided to find another water supply. Fortuitously, a couple of years earlier in 1878, a second site closer to Teesdale had been gazetted following some testing by Wilson in the form of sinking wells. This lagoon, which provided Teesdale's water until 1974, became known as Chinaman's Lagoon. A few kilometres further north, at the border of the Leigh and Meredith Shires was another small bridge which also came in for attention from CAC Wilson during his tenure as shire engineer. This was Taylor's Bridge at Bamganie, so called because it abutted the 1880 land selection of Mr Edwin Taylor. The bridge on Henderson's Road crosses Wilson's Creek just south of its confluence with Woodbourne Creek. Today it is a simple, concrete structure with a graveled surface, barely noticeable as you navigate the twists and turns of the road at this point. In February, 1883 however, it was a timber structure which was unable to stand up to the heavy floods which swept down the creeks to the Leigh River below. The bridge was destroyed and assessment by Wilson and his counterpart from the Meredith Shire determined that a replacement was needed. Contracts were called by Leigh Shire and the following year - after some delays - the bridge was rebuilt in similar form to the original and with a timber and stone culvert reinforcing the road near the western end of the bridge. This bridge served the shires for more than twenty years until in 1905 it was declared dangerous and the Meredith Shire resolved to have Wilson effect the necessary repairs. It was not until August the following year however, that Wilson declared the bridge closed for this purpose. In the late 1880s Wilson designed McMillan's Bridge, a replacement for an earlier timber truss bridge over the Mt Misery Creek (at the time called the Little Woady Yalloak River) on the Rokewood-Skipton Road which had served since 1856. The new bridge was an iron and masonry structure like a number of those described above, employing a pair of 99ft lattice girders in a single span, but reusing the sandstone abutments from the previous structure. The deck was of hardwood topped with road metal. The bridge still stands today on the Rokewood-Skipton Road which at that time, bore the name of the Upper Western Road and ran from the Ballarat-Geelong Road through the towns of Leigh Road (Bannockburn), Teesdale, Shelford and Rokewood, crossing the Leigh Shire to the north of The Lower Western Road which also traversed the shire. Both roads were in large part the responsibility of the Leigh Shire and engineer Wilson. In addition to these better-known structures, Wilson was also responsible for the maintenance and reconstruction of any number of smaller, lesser-known bridges and crossings such as the stone causeway which crossed the Cressy-Shelford Road in the 19th century, and a tiny bridge in Teesdale which crossed Native Hut Creek on Tolson Street. Wall's Bridge still stands there today and is clearly not new. A review of historical newspapers indicates that a timber bridge existed on the site at least as early as the 1870s, however like all such structures it needed regular maintenance and repair. By 1908 it was in need of replacement. Council voted that is should be replaced with an iron girder structure and in March the following year, tenders were called. In a matter of weeks however, it was decided that none of the tenders were acceptable and Wilson and another councilor were to discuss cheaper alternatives instead. All was quiet on the matter until August, 1910 when Wilson provided the council with three estimates for bridges constructed from timber, stone and iron, or concrete. Finally, in March 1911, the council decided upon a timber and concrete bridge and the contract was awarded to John Pryor who had started work by July. Looking at the bridge today, it consists of two timber piers topped by iron girders, overlaid with timber and a - very - thin coating of bitumen. At each end is a small concrete abutment. I am no expert, but would guess that the piers and abutments date back to the final years of CAC Wilson's tenure as shire engineer. Whilst the timber decking also looks to be of some age, I can only assume that if the bridge was built to the original specifications, then the iron girders must have been added as part of more recent repairs, with the timber either reused or replaced as necessary. And so it went on, year after year, decade after decade, bridges, roads, dams, buildings; CAC Wilson designed them all. In total, he was responsible for the construction of at least 108 bridges throughout the district, built first in timber then in metal and concrete as he strove to find practical application for the theory developed by Melbourne University and provide cheaper, more durable alternatives for shire infrastructure. He finally retired as the engineer of the Leigh Shire in 1910 when he was replaced in this role by his eldest son Charles Corbett Powell Wilson. His tenure as shire secretary however, continued for several more years, ending with his retirement in 1917 - a total of 54 years service to the shire. Wilson died in Geelong on 7th October, 1923, survived by ten of his children and is buried in the Portarlington Cemetery.